As you have probably already heard, over the past year we've been working very hard developing Harmonia 3. 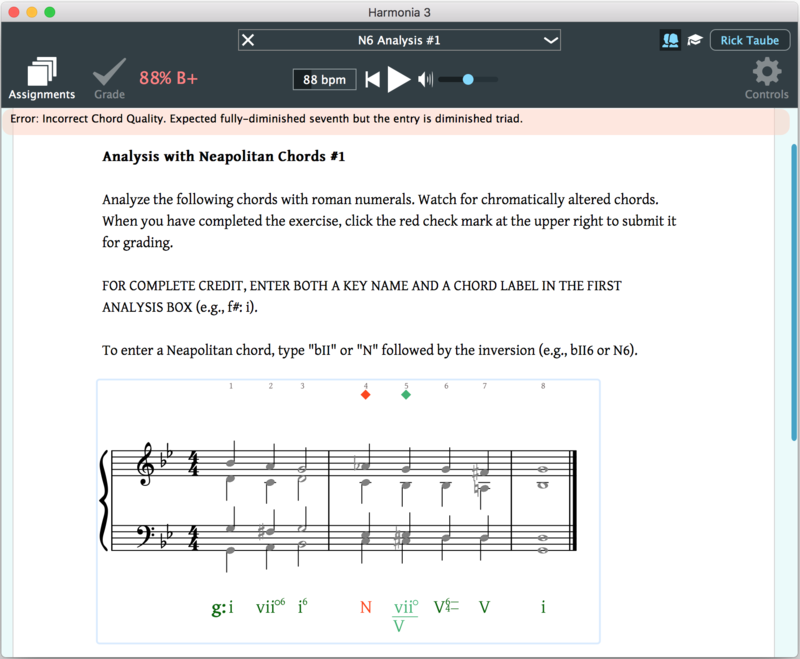 This new app has been redesigned and implemented from the ground up to provide a truly state of the art experience in music theory instruction. A completely redesigned user interface. Drop down dialogs and control panels get out of the way when working in the document. Students don't see control panels, everything they need is at their fingertips in the document. All teacher editing controls have been redesigned and new editing controls have been added for streaming video and audio and also for the new multiple choice items. A new, interactive assignment browser replaces the Cloud Menu. (see picture) The browser displays courses, assignment sets, assignments, and assignment properties in an intuitive, directory-like structure. Students can see all the relevant information about each assignment: how many times they have taken it, what type of assignment it is (e.g. lesson, practice, incremental practice, multiple submission, timed, etc. ), assignment due dates, and grading history. For each grading record, the student can download the completed file and view it directly inside the app. A teacher in student mode is using the Assignment Browser to download an assignment to try out. A new document model provides much more flexibility than in Harmonia 2. 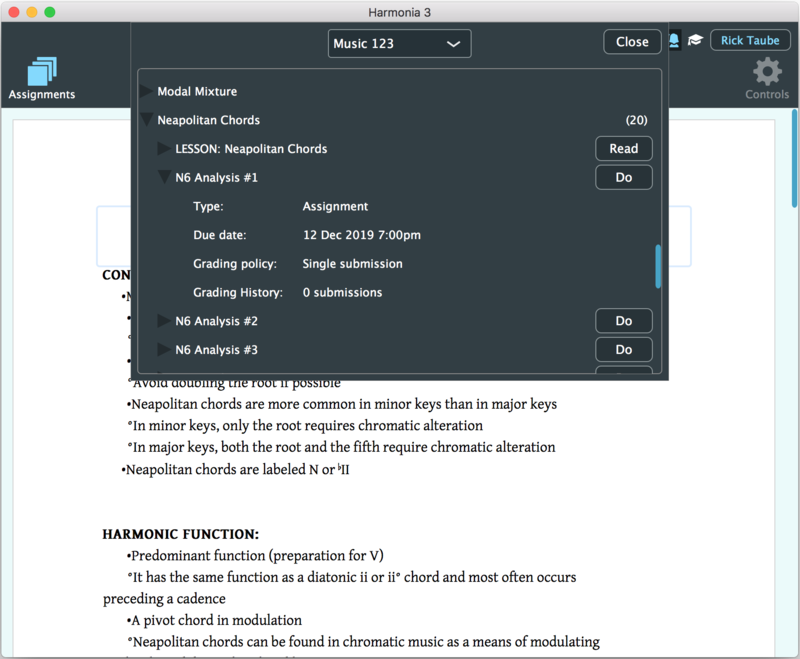 For teachers, the original page objects (text boxes, multiple choice, notation, images) are still available in Harmonia 3, but the new app can also support in-line text (much like a text editor), and different kinds of documents. When students attempt assignments, their work is automatically saved interactively so they can never lose work. Each document also has an unlimited undo/redo stack so they can easily revert from mistakes. Explicit user roles. Harmonia 3's interface and behavior automatically adjusts to four explicit "user roles" that are built into the app. These roles follow a tiered permission level: 1) Unknown, 2) Visitor, 3) Student and 4) Teacher. Users who haven’t logged in inherit the “Unknown” permission level. Unknown users have access to all the application's commands and editing capabilities but cannot save documents. If a user logs in, then they are either Visitors, Students or Teachers. A “Visitor” has access to our Harmonia demo course materials and can experiment with filling out and grading various course demonstration materials. If registered Students log in, then they inherit the student permissions and have access to all the courses in which they are enrolled. Students do not have access to control panels or content commands that design new course documents. If a registered Teacher logs in, then they can toggle between “Teacher” and “Student” permissions. When in the Teacher role, a teacher can create content and new course materials. When Teachers toggle to the Student role, they can download, view, and test out their assignment materials and exactly mimic their students’ experience. A teacher in student mode is testing their assignment. A new Harmonia 3 file format. Harmonia 3 can read Harmonia 2 files and will automatically convert them into Harmonia 3 format when they are loaded. Conversion may not be pixel-to-pixel exact so teachers should review materials once they have been loaded from a Harmonia 2 file. Note, however, that all lessons and assignments in the Harmonia Content Library will already be converted for you. Streaming audio with teacher-controlled constraints: teachers can places constraints on the playback transport and and control the number of times an audio clip can be played. Each teacher account now has its own Media Dashboard on our website where audio files may be uploaded for course streaming. Streaming video from YouTube or Vimeo with a user preference settings: users may specify viewing preferences to choose between watching videos inside the app or in an external browser. Tablet support. Harmonia 3 runs on Mac and PC, and now iPad, Android, and Linux.